The 33-mile Chief Ladiga Trail is Alabama's first extended rails to trails project. The 9 mile section that runs through Jacksonville has a college-town and quaint Southern town atmosphere. From Montgomery, AL: Take State Hwy 21 north into Jacksonville. Turn left onto Greenleaf, go to end of road, turn right onto Alexandria Rd and go approx 1/2 mile and community center is on the left. Jacksonville, first called Drayton, was established in the early 1800's on the site of Creek Indian Chief Ladiga's trading post. In 1834 the town was renamed in honor of Andrew Jackson, seventh president of the United States. As first county seat of Calhoun County, Jacksonville remained the center of local government until 1899 when the county seat moved to Anniston. The Jacksonville Section of the Chief Ladiga Trail extends nine miles from Warren Drive (south) to intersection of the old CSX Railroad in Maxwellborn (north). The property was acquired by the City of Jacksonville from the Norfolk Southern Railway in 1996. 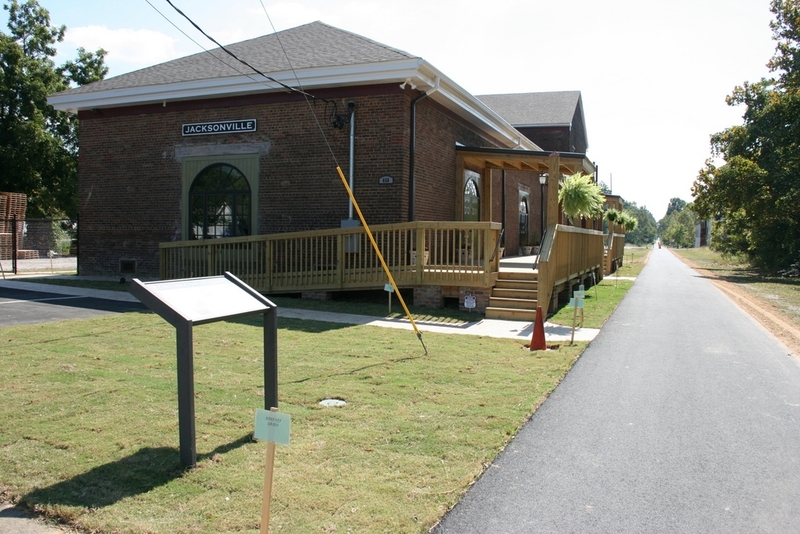 The old train depot was recently restored and is now a support facility for city and trail-related events, as well as a rest stop for trail users. The train depot was first opened on September 1, 1868, as a passenger and freight depot for the Selma, Rome and Dalton Railroad. Many attempts had been made to open the railroad during the War Between the States, but the war effort in the south severely limited the availability of iron for the rails. At the end of the war, the rail bed and bridges had been completed and as iron became available the rails were placed. The newly constructed brick depot became a major stop for passengers and freight between New Orleans and the northern markets. Seen along the way are beautiful wetlands, streams, forests, farmlands, and a horizon filled with mountains. 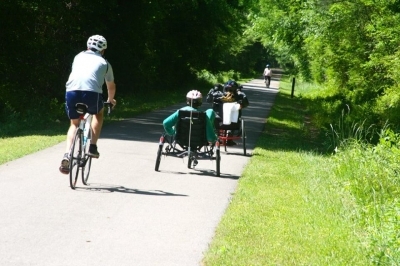 The Chief Ladiga Trail is a family oriented pathway that provides a safe, non-motorized way to travel, exercise and relax while enjoying the outdoors. Just north of Piedmont, Alabama it intersects with the Pinhoti Trail which is a spur of the longest walking path in America - the famous Appalachian Trail. 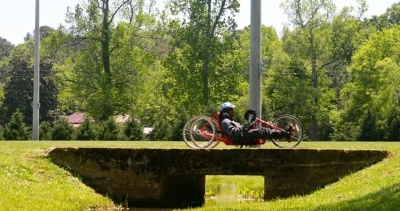 On September 27th, 2008 the "Chief" was connected to Georgia's Silver Comet Trail completing what is now considered to be the longest paved pedestrian pathway in America. Together the trails are 95 miles long with plans for future extensions and spurs. 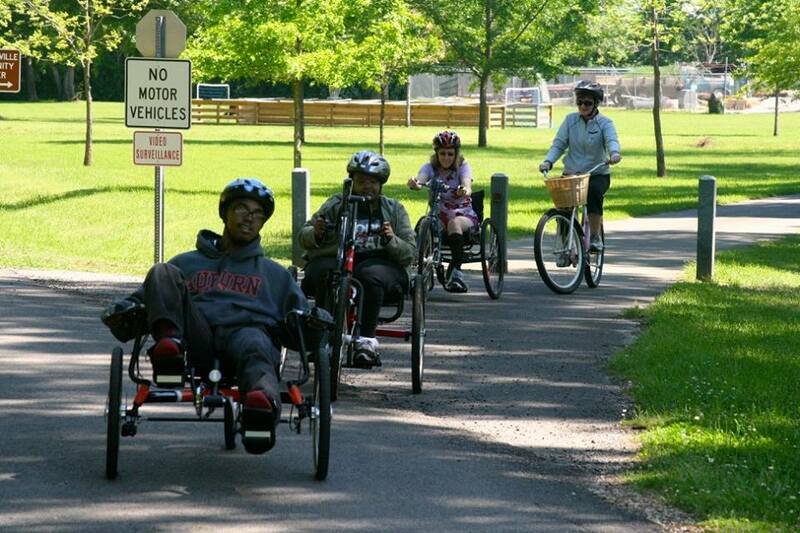 Individuals with and without disabilities can ALL participate and enjoy physical activity. Photo by Lakeshore Foundation. 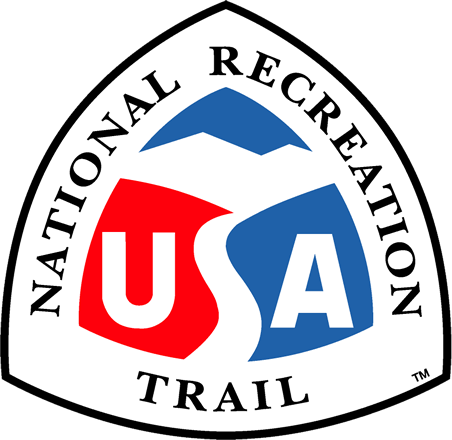 Trail accessibility information sign. Photo by Lakeshore Foundation.